The City of Fremantle in Western Australia teems with history. Founded by Swan River colonists in 1829, it officially became a city a century later. 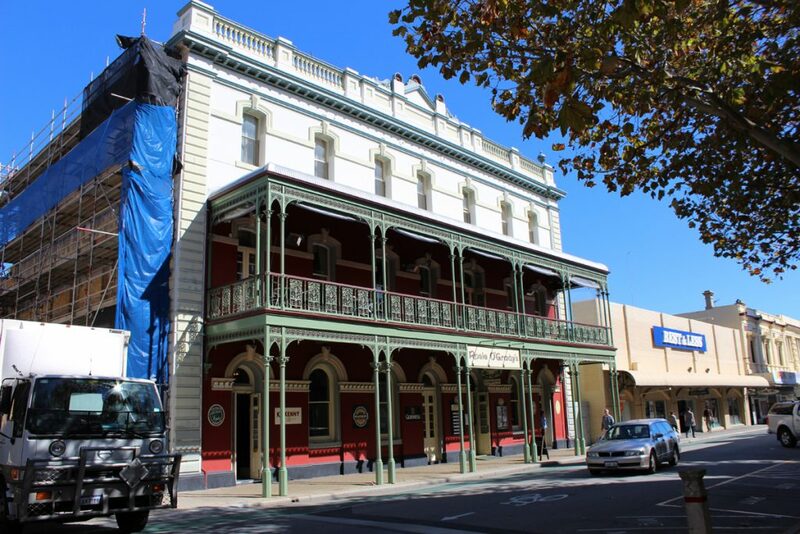 Indeed, much of the architecture in downtown Fremantle dates from the 19th century. The Esplanade Hotel shown above, for example, was originally used to house convicts while the Fremantle Prison was built. In 1892 it became a hotel. It underwent numerous renovations and expansions over the years including 1985 for the America’s Cup. It now has 300 rooms and is designated as a heritage site. 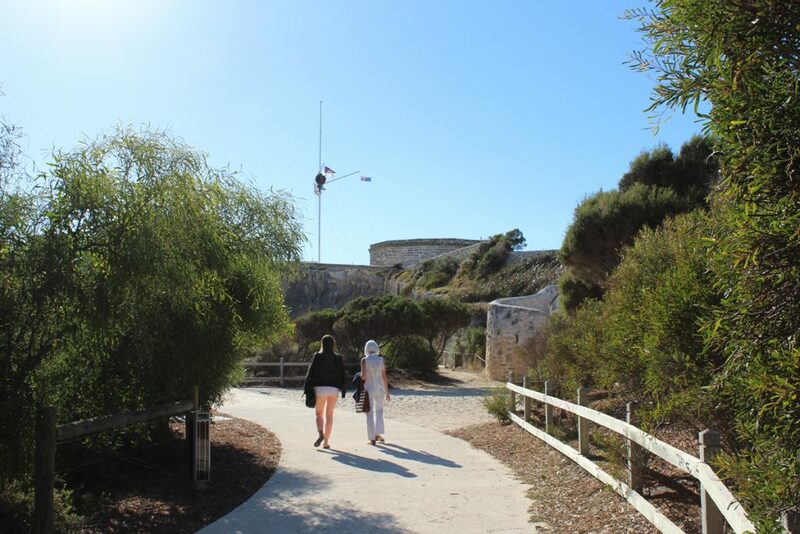 Fremantle is a quaint little city of just 27,000, but it is a bustling one. Located at the mouth of the Swan River, it serves as the seaport for the metropolis of Perth about 18 kilometers upriver. 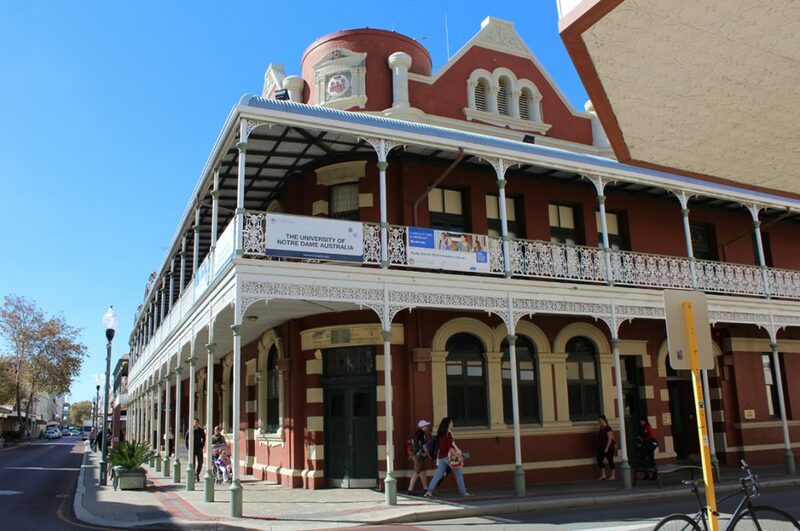 Downtown Fremantle is compact with all major venues within walking distance. In the map below, for example, the distance from Fremantle Prison to the WA Maritime Museum is just two kilometers or a 25 minute walk. In a previous post I related our night time tour of the Fremantle Prison which served as a maximum security penitentiary until 1991. But there is much more than the prison to see here. 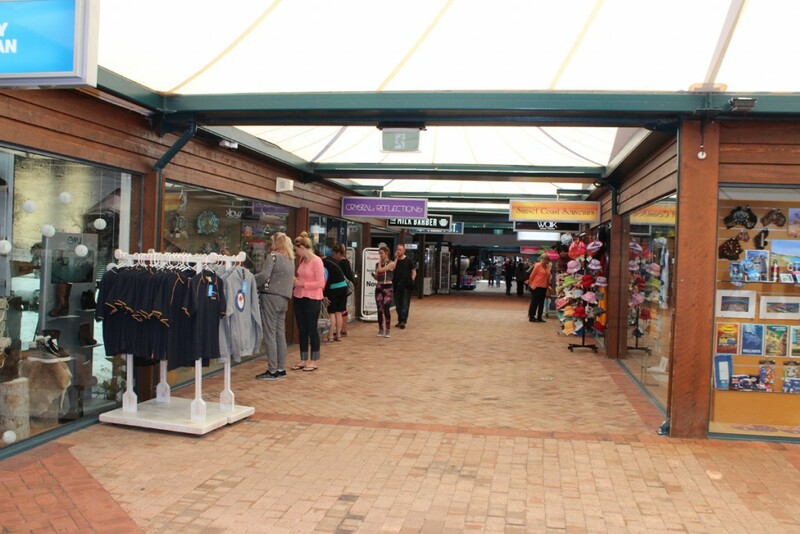 On our first visit, we parked near the Fremantle Oval and visited the Fremantle Markets. 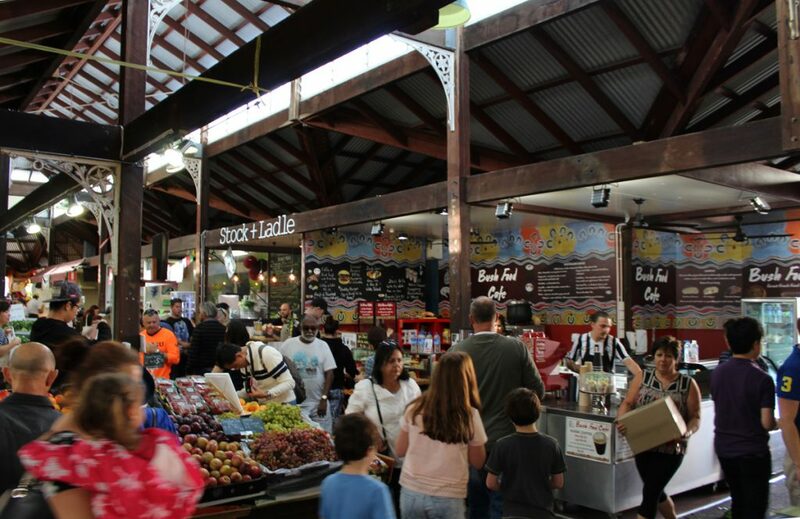 Founded in 1897, these public markets feature farm fresh produce, a variety of artisans and crafts, restaurants featuring Aussie cuisine, and, of course, buskers. 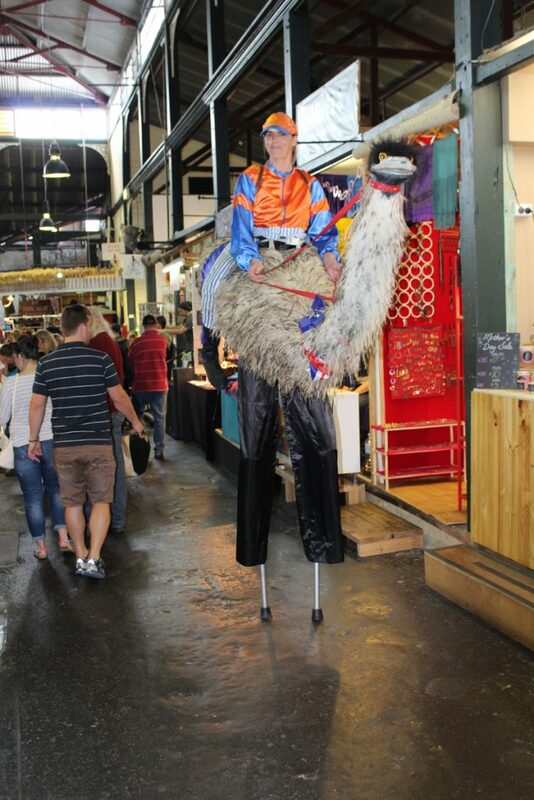 We were much amused by a young woman on stilts in an emu costume that day. 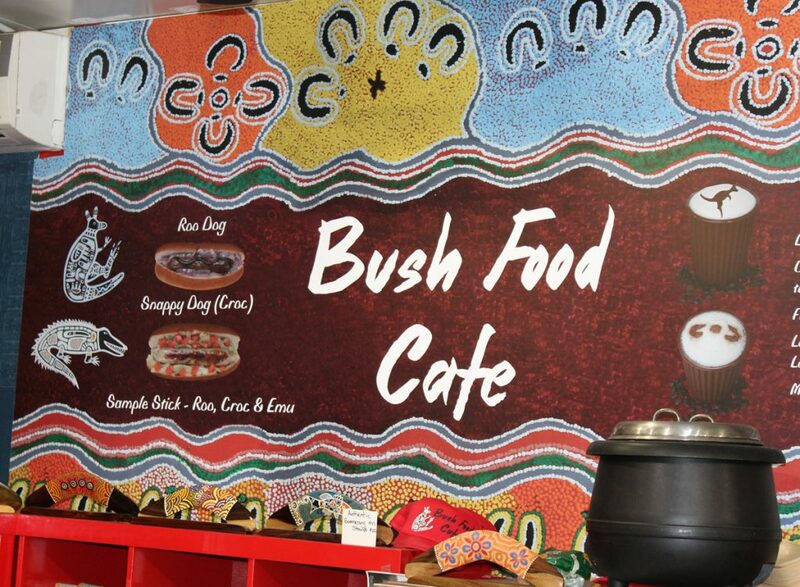 One of the fast food joints called itself the Bush Food Cafe and featured roo dogs, croc dogs and a sample stick containing roo, croc and emu! On our first visit we saw a busker playing a lively rag on the piano and on another visit we saw a seven year old guitar prodigy. 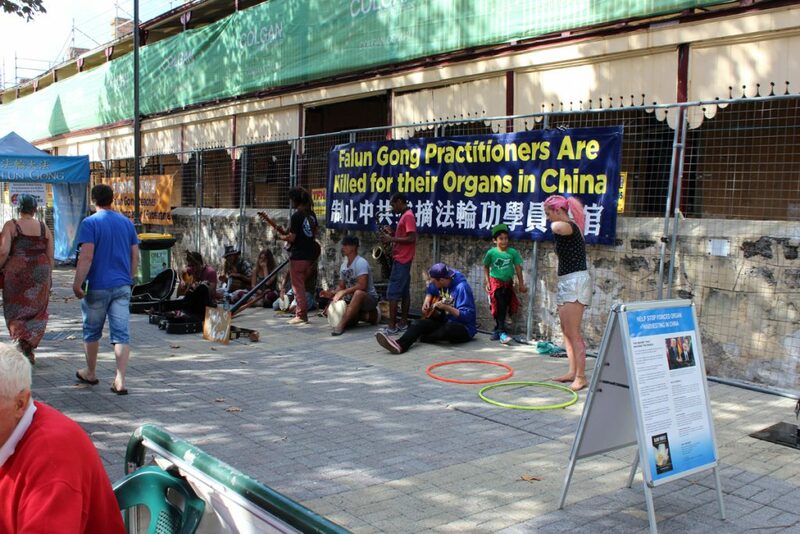 Outside there were a variety of street entertainers and promoters of various causes, including the Falun Gong. On leaving the markets we walked down a street of wall-to-wall restaurants towards the waterfront. We passed through Esplanade Park across from the hotel on the way. A permanent Ferris wheel is tucked into a corner of the park. A number of craft breweries lined the shore road (Mews Road) and we ate at one of them that first visit. Passing between a couple of them brings you to the wooden boardwalk that goes around the inner harbor. This is a popular venue for its many fine restaurants. One notable eatery is Kailis Fish Market Café, serving “award-winning fish & chips” since 1928. 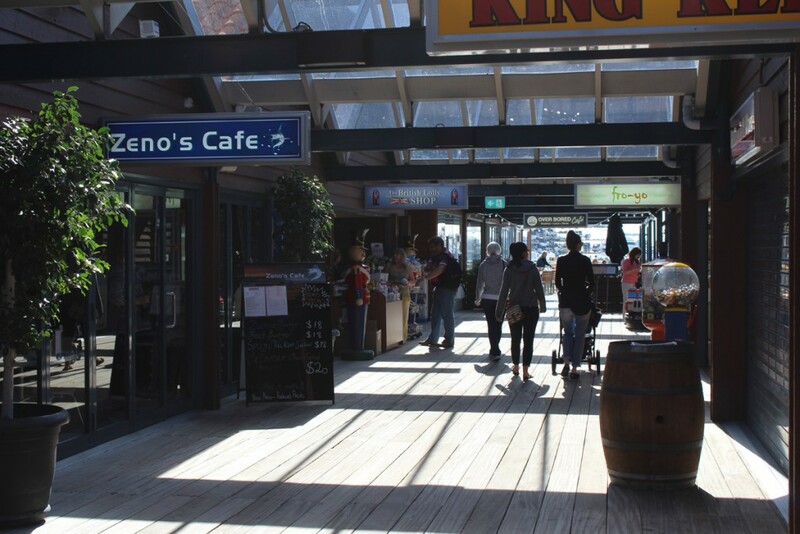 A wooden boardwalk surrounds the Fremantle harbor. 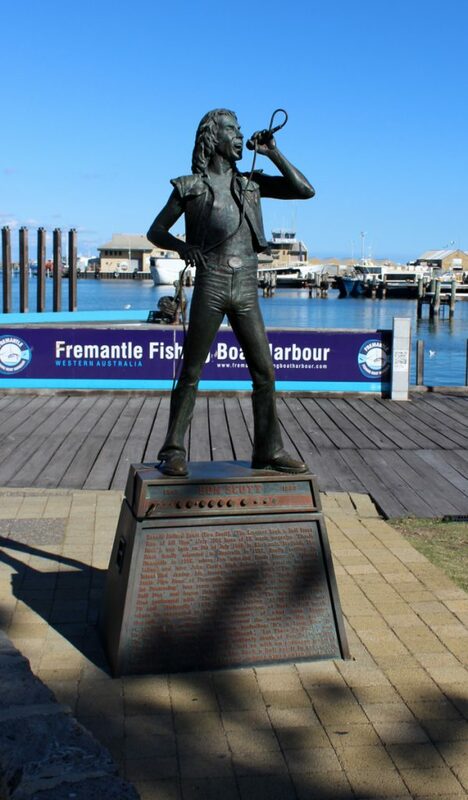 We were surprised to find a statue of Bon Scott, the lead singer of AC/DC who passed away in 1980. The base of the statue hails the singer as “the greatest frontman of all time” as noted in the magazine Classic Rock. Although born in Scotland, Scott moved to Australia with his family at age six and grew up in Fremantle. 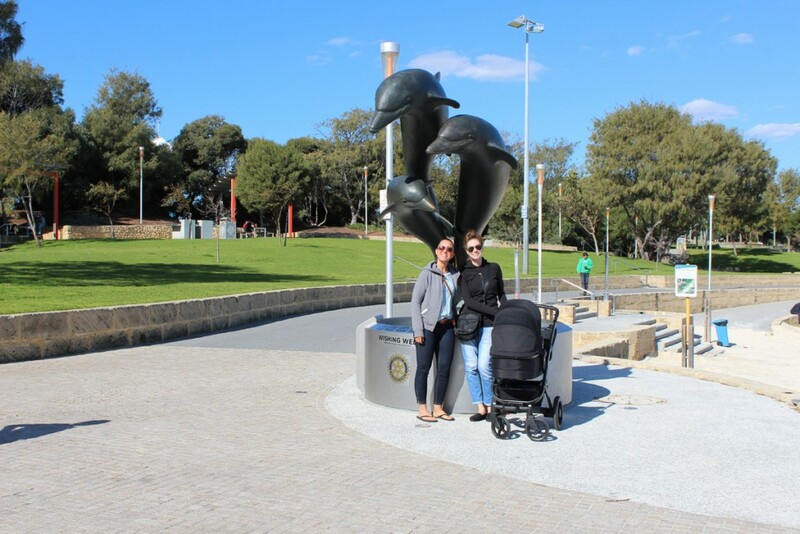 On our second visit to Fremantle, Janis and I had taken the train to Perth and then a cruise down the Swan River to Fremantle. Not far from the railroad station is Bathers Beach. Atop a bluff beside the beach you’ll find the Round House. Built in 1830, the Round House was the first permanent structure in the Swan River Colony. It was built as a small prison with eight cells and a jailer’s residence. Those of a philosophical bent will be interested to note its design was based on the Panopticon, a blueprint for an ideal prison designed by British philosopher Jeremy Bentham. The cells are arranged in a semi-circle so one jailer can observe all prisoners at once. Bentham theorized that since the prisoner never knew if he was being watched, he self-regulated his behaviour. Inside you can see the cells as well as a stocks. A placard indicates the offenses that could land you in the Round House as well as remarking that only one prisoner was ever hanged at the Round House – sadly the condemned was only fifteen at the time. 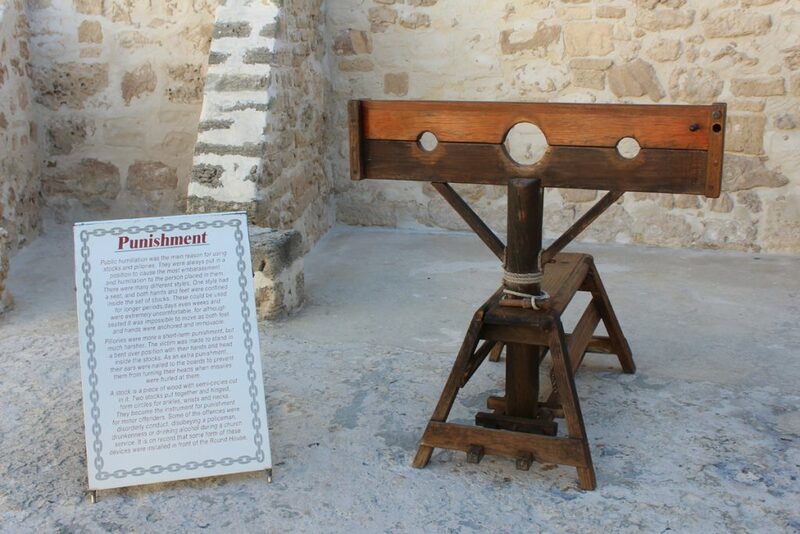 The detailed information sign for the stocks tells you that the prisoner was held immobile by the hand holds and leg-irons. Sometimes the subject’s ears were nailed to the frame so he could not move to avoid rotten tomatoes and other debris thrown at him by the jeering crowd. We walked on through the town taking in a variety of city sights. We passed the University of Notre Dame and its beautiful red brick buildings, past shops and iconic hotels like Rosie O’Grady’s which was undergoing some renovations. 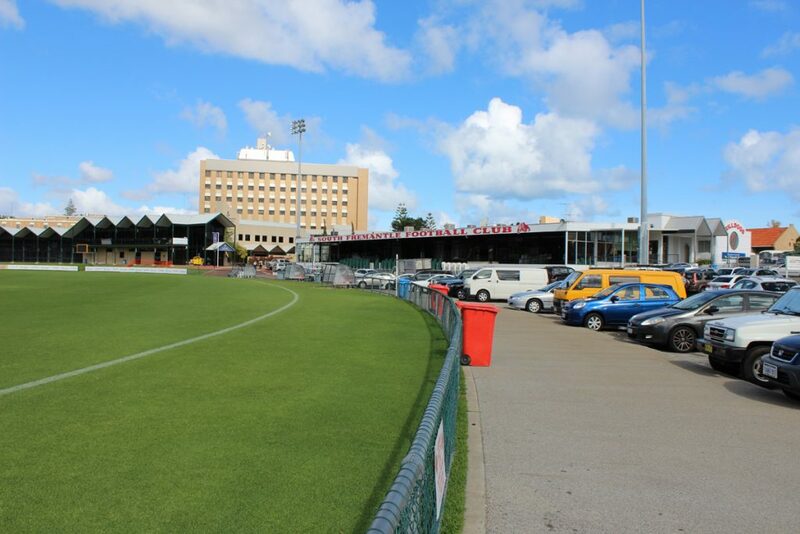 We ended up at Fremantle Oval, home of the Fremantle Dockers football (soccer) team. One of Janis’s friends from work was a huge Dockers fan so we thought we’d get a souvenir for her. When we got there, a few players were on the field being interviewed by a television news reporter. While Janis was busy buying the souvenir, I popped out and noticed the players coming off the field. I approached them and explained that my wife’s friend was a Dockers fan in Canada and asked if I could get a picture of them with my wife. They kindly agreed. I quickly got Janis and the picture. Janis and three players from the Fremantle Dockers – big fellows all! Needless to say, her friend loved the picture and had it blown up and posted it on the store’s bulletin board. 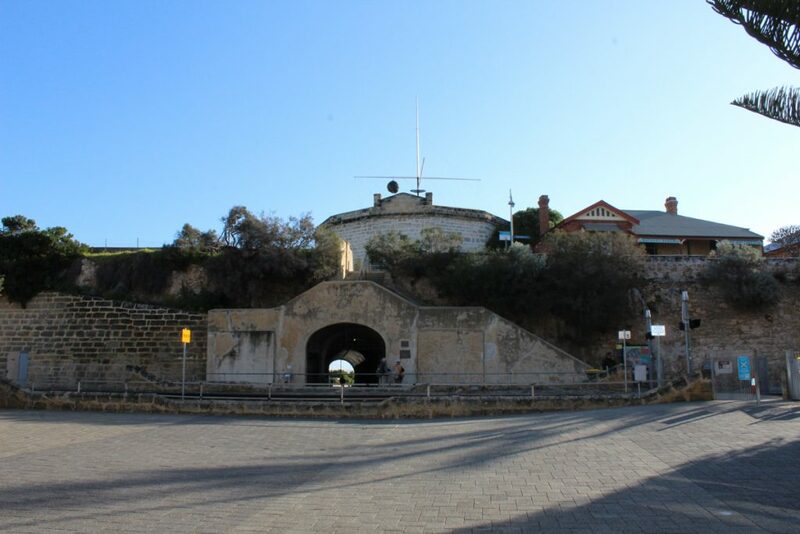 Fremantle is an old city which has managed to maintain its colonial charm. No buildings are more than a few stories in height and many sport period architecture, including some with sweeping second floor balconies. There are a lot of restaurants, several craft breweries, a marvelous waterfront, historic prisons and a fair amount of public art. You can easily spend a day or two exploring the old town. You’ll find a couple of photo galleries linked after this article, but I leave you with one final iconic building – the Norfolk Hotel. The building is pretty non-descript but is notable for the haunting mural on its side – the face of woman. Built in 1887 as the Oddfellow Hotel, the building was refurbished and re-opened as the Norfolk 100 years later in preparation for the America’s Cup. 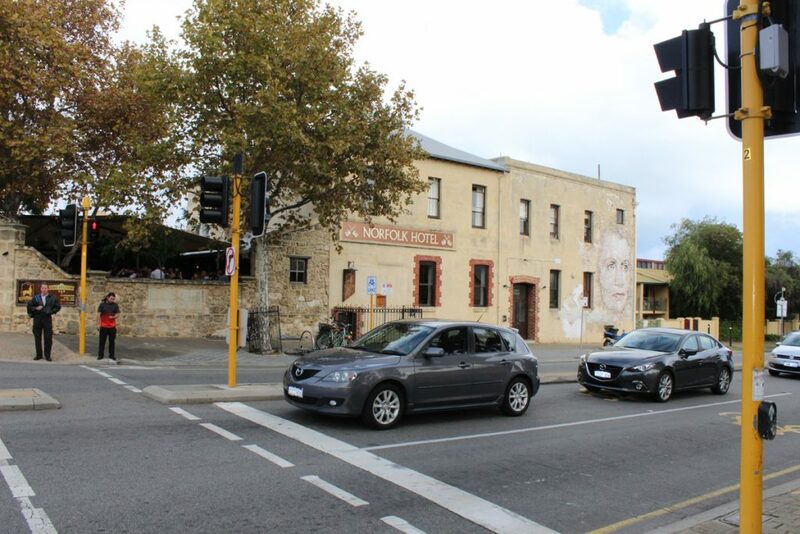 It has a long history as one of Fremantle’s favorite watering holes. Indeed, for over fifty years it was owned by the Swan Brewery. After a succession of owners, the hotel is now owned by a noted hotel company and the lease has been held since 1989 by the partner in another brewery. 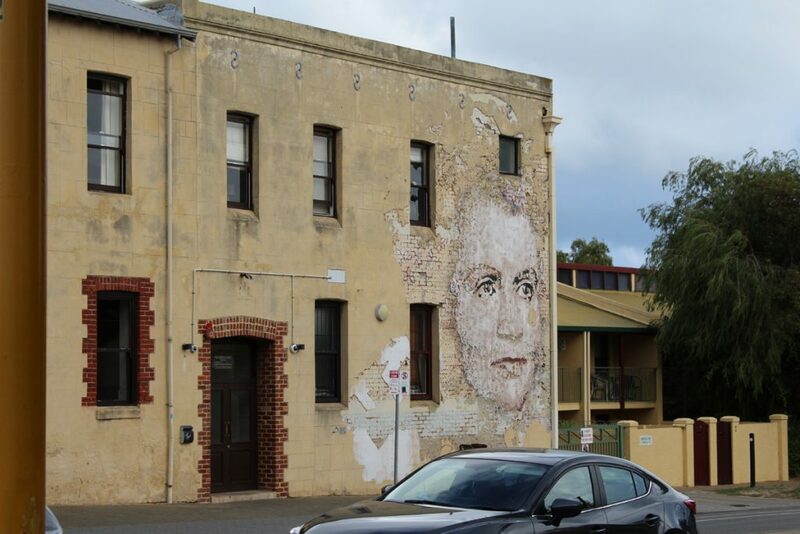 The mural is actually a bas relief sculpture by Portuguese sculptor Vhils of Australia’s first female senator, Dorothy Tangney. Below are some additional links, including two photo galleries. If you are on the front page of this website, you just have to scroll down to see the photo galleries. 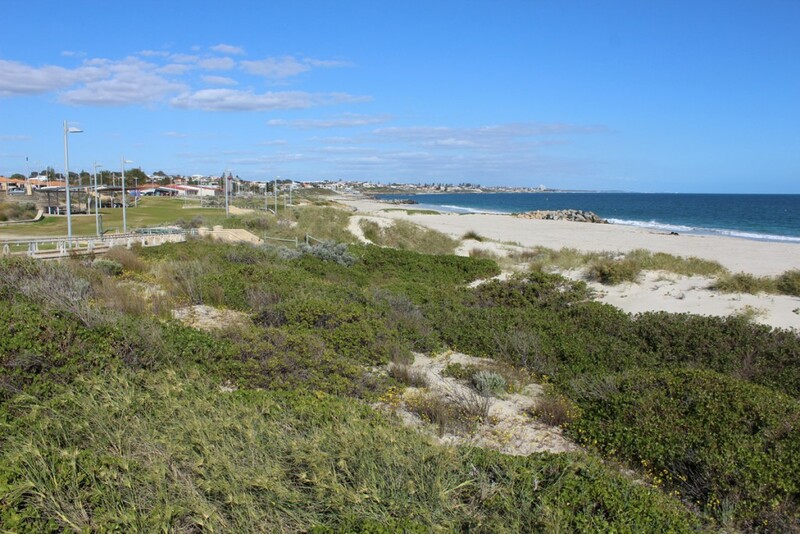 There are a number of small harbours up and down the coast of the Greater Perth region. The largest, of course, is Fremantle which is a major port. The smaller ones mainly serve pleasure craft and a number of those are tourist destinations as well. That’s the case with Hillarys Boat Harbour, about 23 kilometres from downtown Perth or a 35-40 minute drive. The easiest way to get there is to take the Mitchell Freeway (Highway # 2) and turn left onto Hepburn Avenue which takes you all the way to the marina. The map above is an earth view of Hillarys. Click on the View Larger Map button and you’ll see it on a full page. There you can use CTL and your mouse to rotate the map any which way you choose. The Breakwater complex has a fine dining restaurant upstairs and a more casual rendez-vous below. The large boat moored there is the Rottnest Island Ferry. A couple of breakwaters enclose the marina. where many private boats are moored. One of the Rottnest Ferries docks here. The other’s home port is Fremantle. But for visitors, it’s the shopping mall and restaurants that are the big attraction. 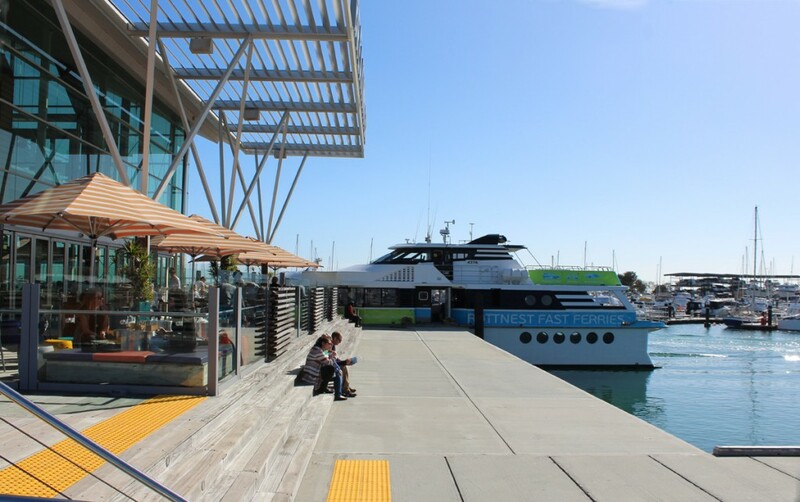 Formally called Sorrento Quay, it features wide boardwalks and a concert staging area completed in mid-2016. Reataurants abound here. 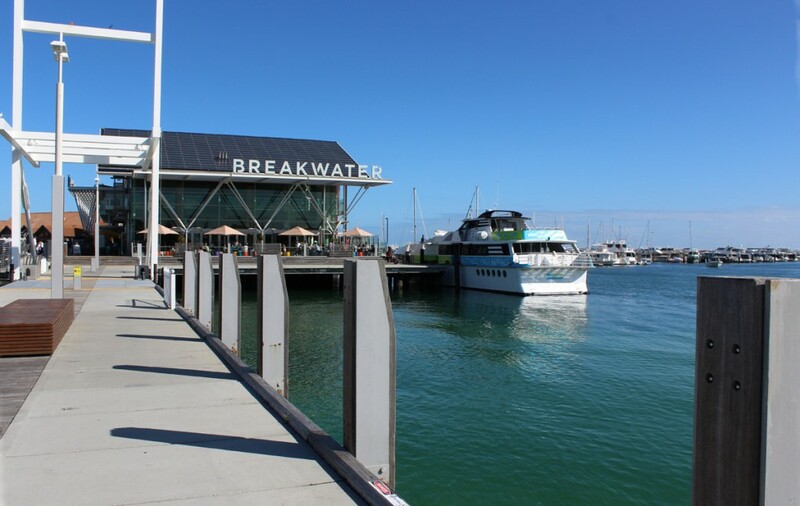 You can find casual fare like Grill’d or Dome to the the classy Breakwater which has four facilities, the casual Lower Deck to the upscale Ishka Restaurant and adjacent Reid’s Lounge. You can also reserve the Akoya Suite for corporate functions and even weddings. 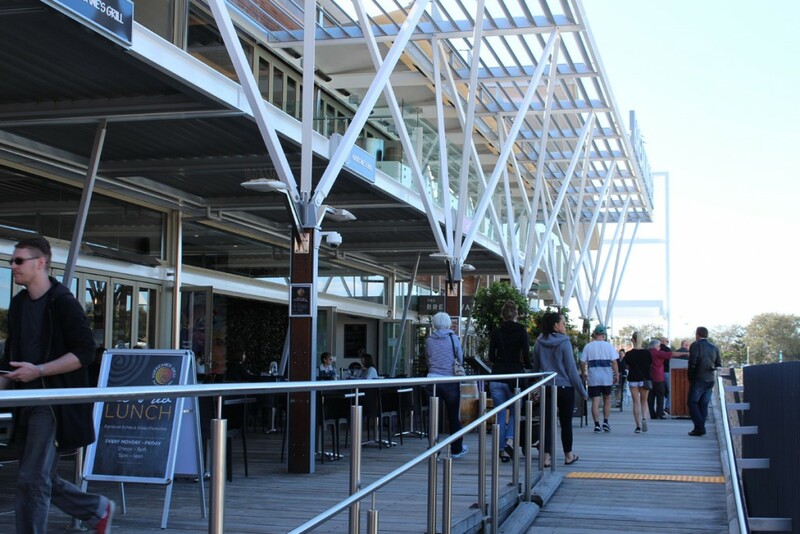 Zeno’s Cafe and fro-yo are among the many food service outlets at Hillarys. 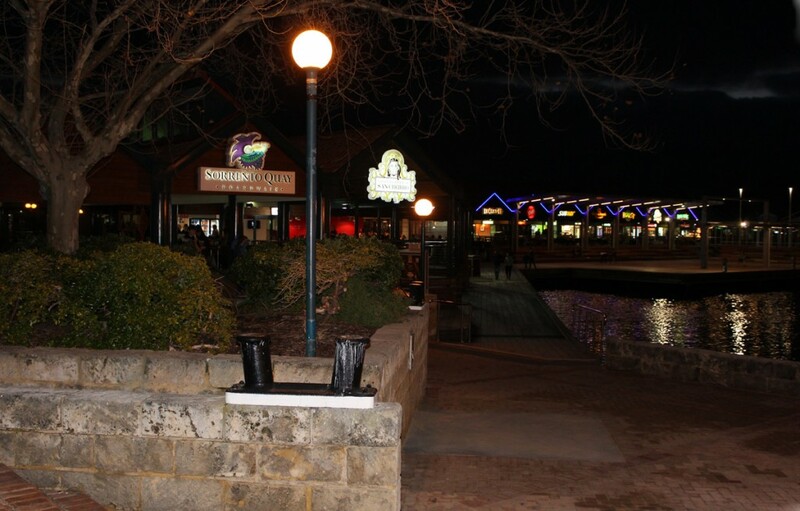 Much of the quay and boardwalk is on stilts above the water. There are specialty food places like Ben and Jerry’s Ice Cream, Belissimo Gelato, La Chocolateria and more. Or fast food like Subway or Little C’s Pizza. Scrolling through eateries on their website, I counted 34 of them. There are also a lot of specialty shops. 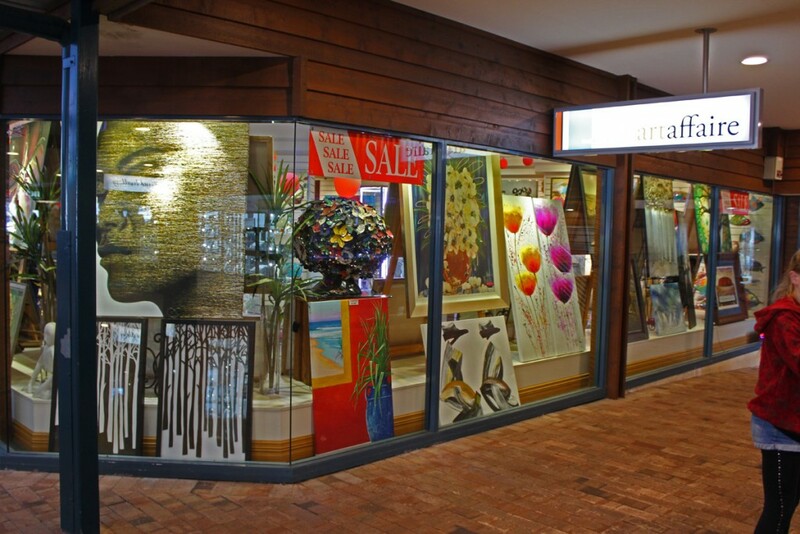 Everything from clothing stores to souvenir shops to a barber shop and a candy shop. Around 30 different shops. While the mall is open air, it does have a skylighted roof over the passageways. The quay and boardwalk wraps around an inner bay with beach and waterpark. The complex of restaurants and shops wraps around an inner bay which includes some shallow beaches for swimming. And on the shore is a large children’s complex called The Great Escape which includes a waterslide park. Unfortunately the lease ran out for The Great Escape and it is currently closed until a new tenant can be found. But it is scheduled to partially reopen for the Australian summer starting November 26th. Cockatoos like to hang out near the waterslide park. 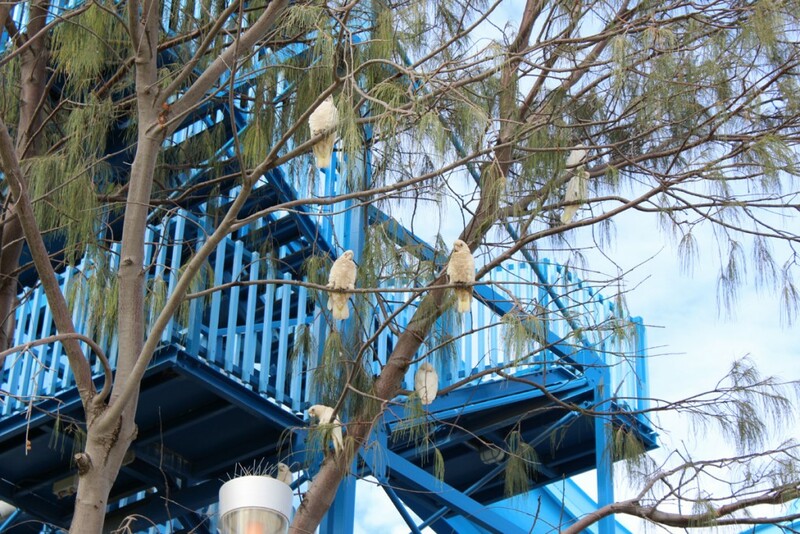 When we first visited Hillarys in May 2015, the waterpark was a popular hangout for wild cockatoos. At the other end of the complex you’ll find the Aquarium of Western Australia. We never got around to visiting it so I can’t rate it. And there is an apartment hotel complex, an exciting alternative to staying in a large hotel. A bridge and walkway over the harbour connects the mall and the shore. 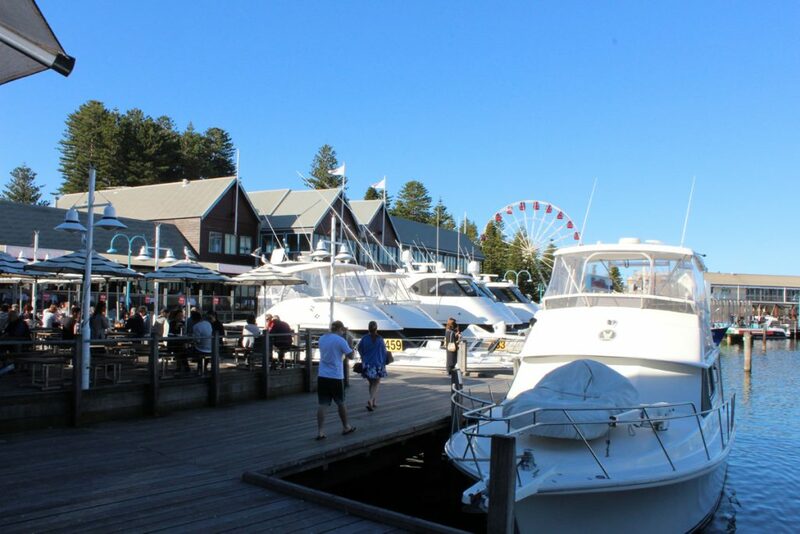 There you’ll find another restaurant, the Hillarys Yacht Club, the Department of Fisheries building and some commercial buildings. You’ll also run across the Three Dolphins statue and fountain. Sarah and her friend Natasha with the Three Dolphins. A short walk takes you past a couple of shallow beaches and back to the other end of the quay. Here are a few more restaurants and still more shops. Hillarys Boat Harvour at night. 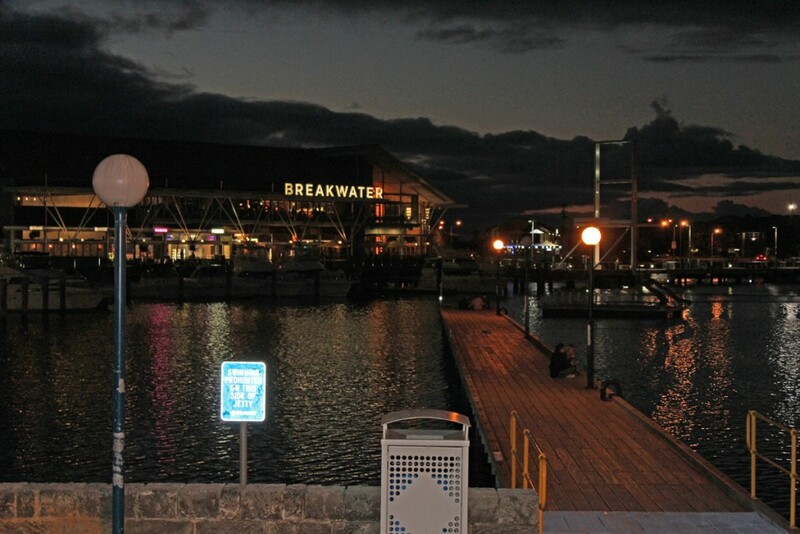 We happened to visit Hillarys one Friday evening and the quay is beautiful lit up in the evening. 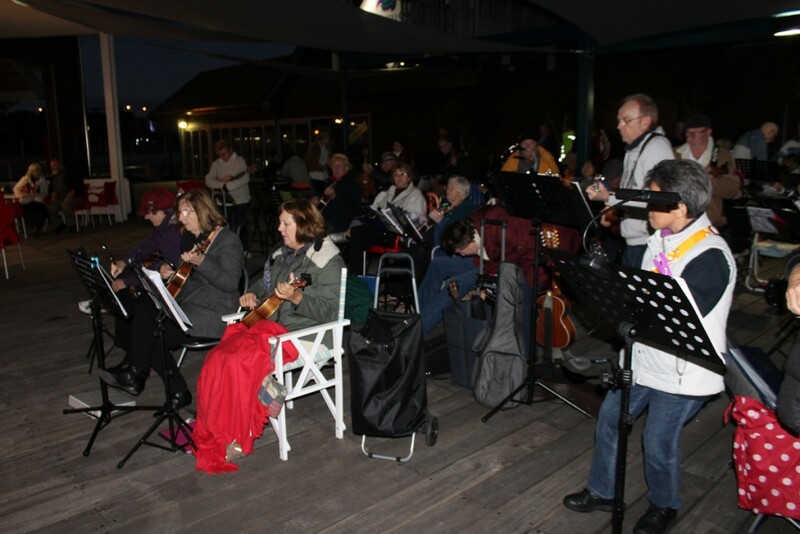 For some entertainment, Perth’s Northern Ukulele Group meets here every Friday from 5:00 to 7:00 PM. 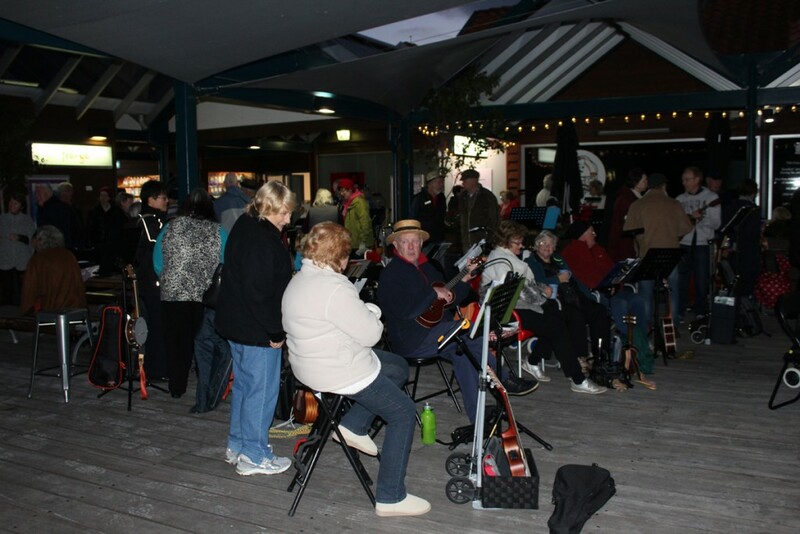 I never would have guessed there were so many ukulele players in Perth. And that’s just one club. There’s a website that lists ten different groups of enthusiasts. Who knew? If you’re there on a hot sunny summer day, you may want to spend some time at Sorrento Beach which is just a short walk away. Like most Western Australian beaches, this one has pristine sandy beaches, a grassy park area and barbecue areas for family picnics or group outings. 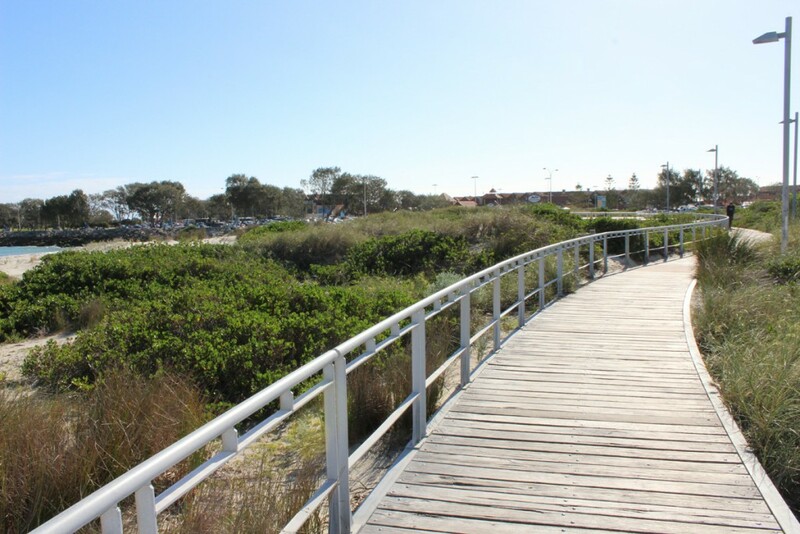 The boardwalk from Hillarys to Sorrento Beach. 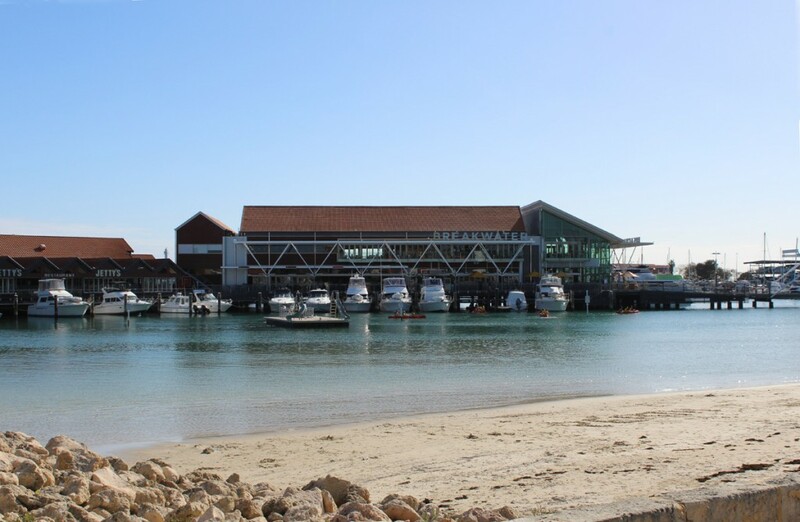 Since opening in 1988, Hillarys Boat Harbour has continued to be a popular venue for both locals and visitors. Do check it out. And if you are arriving or leaving around 5:00 to 5:30, you can catch a glimpse of kangaroos in the wild at Pinnaroo Valley Cemetery. I know that sounds odd, but check out the article I wrote about it a while back. We’ve been back several times. One of the best places for kangaroo watching in my opinion. 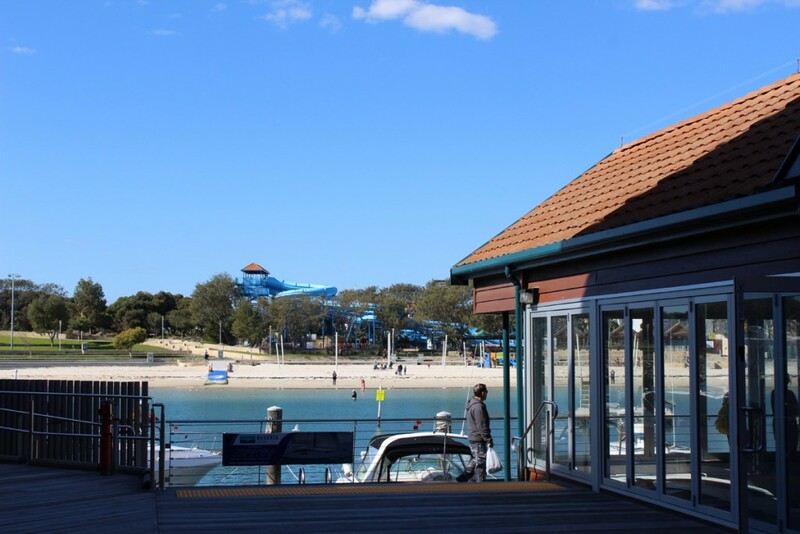 Below is a link to an additional photo gallery as well as to some Hillarys Boat Harbour attractions. 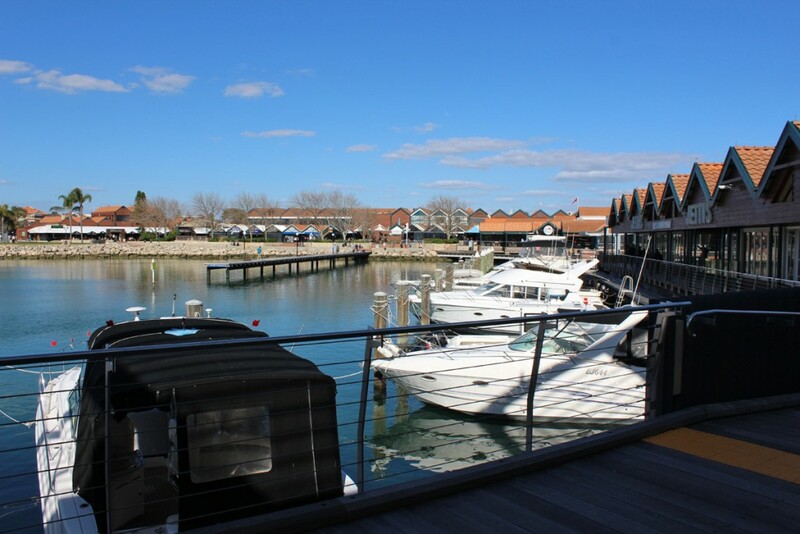 Here are some additional photos of Hillarys Boat Harbour. Above – Hillarys Boat Harbour seen from Sorrento Beach. Clothing stores to souvenir shops. There’s lots to keep you interested. 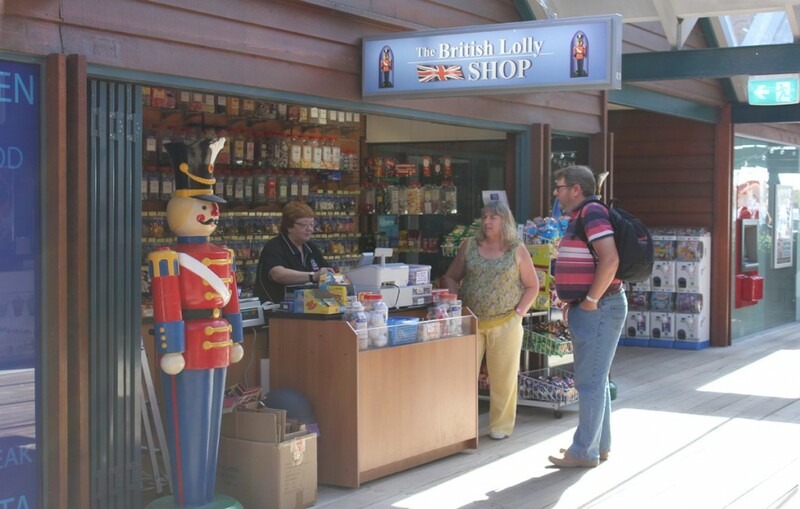 The British Lolly Shop – everything for the sweet tooth! The Boardwalk beside the Breakwater. Many of the restaurants have outside patio seating available. 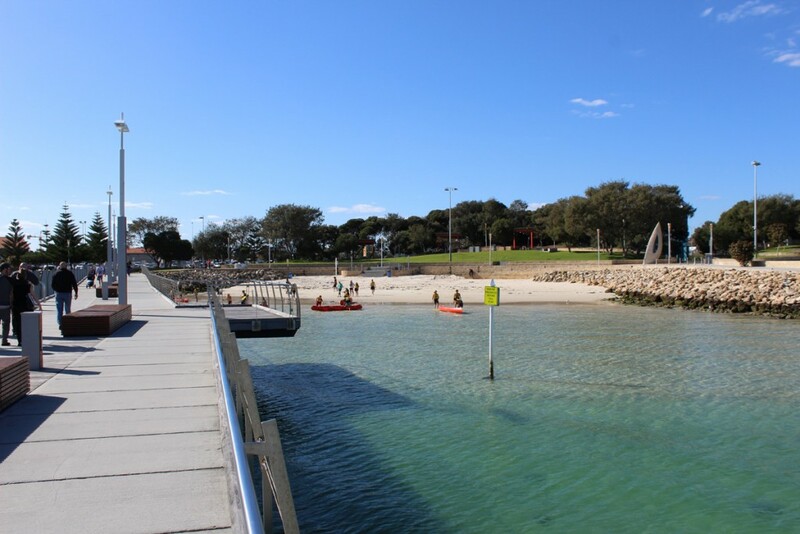 Beaches and canoe rentals – two of the activities available at Hillarys. 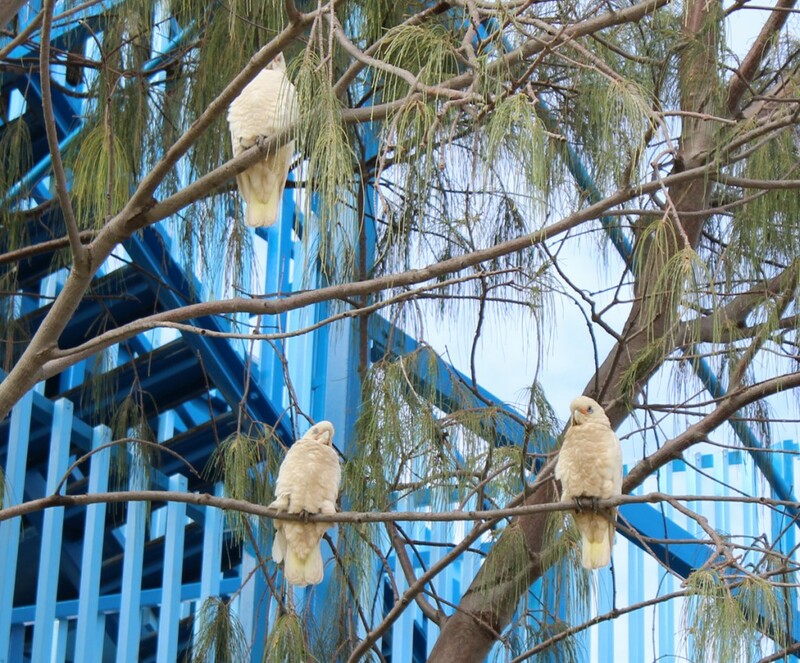 Wild cockatoos roosting on the trees near the waterslides. 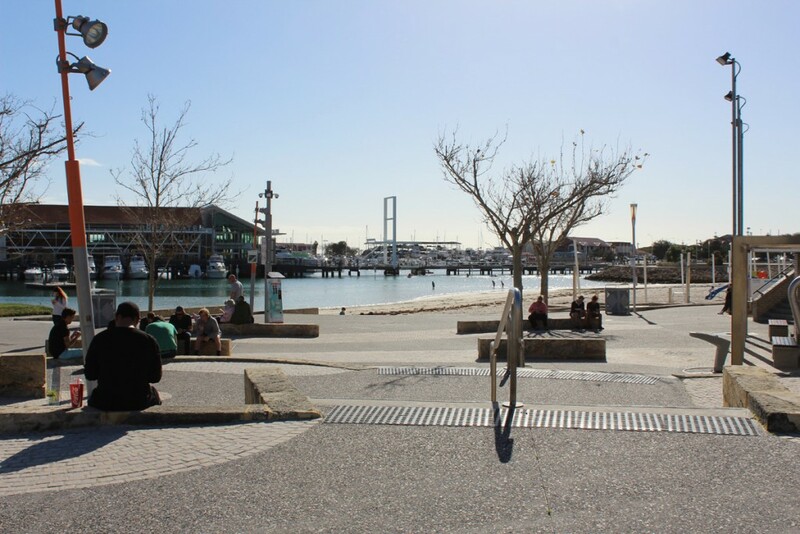 Hillarys Boat Harbour showing the bridge and walkway from the end of the quay to the shore. The breakwaters. There is open water between the end of the light beacon and the distant breakwater.